Thank you for joining Early Access and providing such great feedback! We still have a lot of work to do. Progress will be slow and steady. 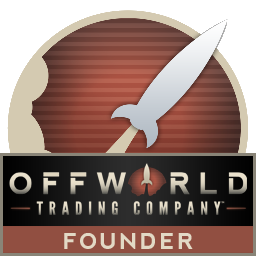 If this new update causes you issues, please let us know in the Offworld Trading Company Support forums. Save games may not be valid between updates. (http://forums.offworldgame.com/forum/1078) Thank you! Major Campaign changes. Please check them out! New art & effects for Electrolysis Reactor! After a player is bought out, s/he can now see how much cash each player has on the main UI (instead of the buyout percentages). Music is finally played correctly through both channels! You can no longer join a game as an observer. You join a game and then set your handicap to “Observer” to be an observer in the game. Switched Mac print screen command to CTRL+LEFT_BRACKET for hi-res screenshots, and CTRL+SHIFT+LEFT_BRACKET for hi-res screenshots without UI (thanks mischanix). … and a whole bunch of other cool stuff! NOTE: You will not be able to play multiplayer with anyone not on the same version as you! Only the version prior to the current update will be made available. I see we can by upgrades for the colony in the campaign. What for? And are there any more details on the campaign changes? Watched Zultar's preview video. I think that answered it. Upgrading the colony is a way to raise your stock price and demand for certain things from the colony. Zultar wasn't clear yet on the victory condition, whether it be stock price or colony upgrades. He also mentioned that the campaign is now a limited number of days per round, instead of the previous buyout victory condition. Shift+S the hotkey for solar panels cause the screen to jump downwards. We'll remap it on our side so it works appropriately, but you can modify it yourself in hotkeys.xml! Some nice changes. Keep up the hard work! Where is the Hotkey.xml file located on Mac? I can't seem to find it anywhere. I will look into the oddness with Solar Panels.